A very unique tree, the Carolina Sapphire has a beautiful steely blue/green color and a wonderful aromatic fragrance. Its dense, lacy foliage is capable of handling light to medium weight decorations. It has a symmetrical and pyramidal growth habit and is soft to the touch. 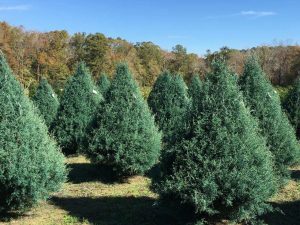 The Leyland Cypress is a beautiful tree that has become the most commonly grown Christmas tree in Georgia. The Leyland has upright growing branches with an airy, feathery appearance. Once combined with lights and ornaments, it is transformed into a holiday treat for the home. It also has a light scent that may prove beneficial to anyone having problems with more aromatic trees. The Leyland maintains its freshness extremely well. If properly watered, it will look just as good the day it is taken down as the day it is put in the stand. 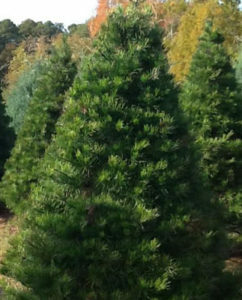 For many years, the Virginia Pine was the predominant tree grown in Georgia for Christmas tree production. Today, many families still seek this tree to use as their traditional Christmas tree. This tree has stout branches with 1.5 to 3.0 inch long needles. It has a traditional aromatic pine scent that adds that special touch of the smell of Christmas to a home. Because of the stout branches, the Virginia Pine also does a great job of holding heavy ornaments. 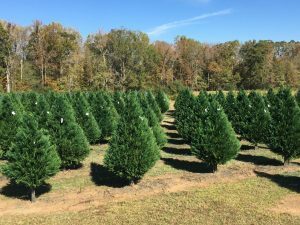 The Christmas trees grown on our farm are our most popular sellers, however every year we began to have more customers ask if we sold Fraser Firs. Since Frasers do not grow this far south, at least not very well, we would sadly say no and have to watch a customer drive away. Several years ago we began to bring in pre-cut Frasers to meet these requests. The Frasers we bring in are premium grade trees obtained through reputable sources. The trees are harvested in North Carolina and shipped to Georgia in a timely manner in order to maintain tree quality. 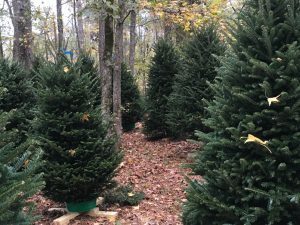 Upon arrival, at our farm, the trees are unwrapped, trunks placed in containers of water, and displayed in a shaded wood lot. These steps are taken to aid in maintaining tree quality on the farm as well as in your home. We have trees ranging in size from 4 to 9 feet tall.